Picture By Soumi Haldar – Grab a cuppa, tell a story or listen to one. I hope I remember right that it’s your birthday around this time. I wish you a fun filled birthday and a life full of happiness. I thought of writing to you today and not miss the moment. The thing he held out was a cassette, an old relic of forgotten times I must say. He has never heard a cassette being played out though he has seen a cassette player at his grandparent’s house. 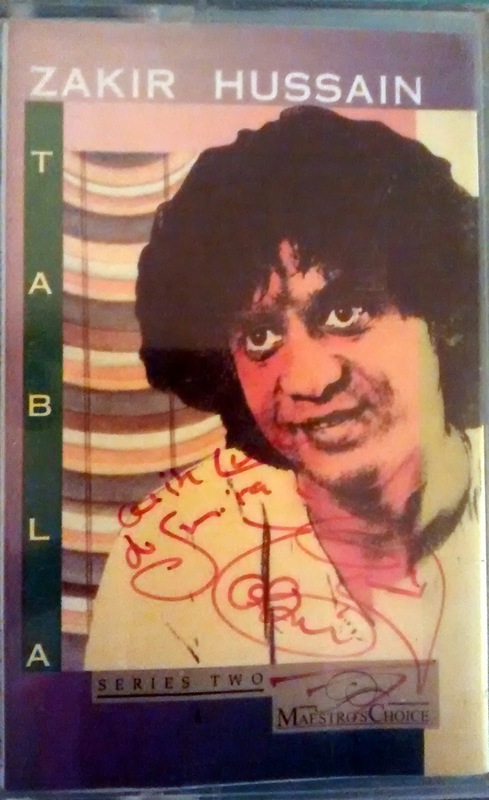 This cassette happened to be a Zakir Husain tabla: series two from the maestro club with Side A: Teentala and Side B: Ektala. What meaning does this cassette hold for a 9 year old? Well that brought a chapter out from the memories of a mother from an almost forgotten but much cherished time from her past. And I told him this story. It was a cold damp afternoon in Baroda – Vadodara. To escape from the rain we had gotten into a music store. We all in the hostel loved music, music of all sorts, bollywood numbers, ghazals, classical music, you name it. We shared our interest in Gulzar penned songs. Now we – from what I remember, in we it was me and you Soumi, who had gotten into this music store and our other friend Anubha had stepped into some other store around to pick something else. So we were roaming around the various familiar aisles – Kishore Kumar, Mohd Rafi, latest releases and other unending compilations while keeping a tab on the rain situation to figure out when to head out. Suddenly one of the store helpers came running in a possible bid to keep us around to make some sale and also have ‘fans’ swooning for this celebrity who was going to walk in. We looked at each other in disbelief. We quickly scrambled for what was available. Soumi picked something and I found this cassette that you have now and we were standing and waiting, we know that Anubha must be waiting downstairs for us by now. But the store lady said 10 minutes right, so why not just wait. Of course it took more than that when finally the great one did arrive. And more words in Bangla – he had lived some part of his life in Kolkatta and knows Bengali well. He also said that Soumi was a lovely name and something else about the meaning of the name or something else (which I forget). For there we were, our heads spinning with excitement – Zakir Hussain for real, signing autographs for us, talking to us, no crowds stealing the glory of the moment! Enjoy your special day and keep writing and photographing! The Author Of The Letter : Smita Namboodiri, is a college friend of our resident editor and photographer, Soumi Haldar. Smita has a photographic memory and is a mother to two lovely children.